Sorry for the interruption in service. The place where I posted each afternoon is no longer allowing me access to WordPress. For the foreseeable future, I will be posting at 6am Monday through Thursday (and occasionally Friday). The break in routine is a little frustrating, especially since it wasn’t something I chose to do, but I’m seeing it as an opportunity for people to read me with their morning coffee instead of their lunch coffee. That being said, thanks so much to all of you who stopped by during this brief hiatus 🙂 Traffic, if anything, has increased during this period, due in no small part I’m sure to M.S. 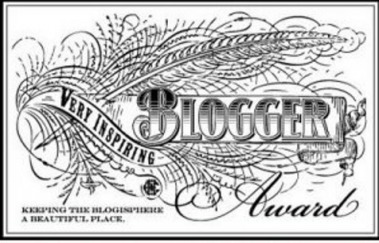 Fowle and her kindly nomination of this blog for the “Very Inspiring Blogger” Award. We crossed 50 followers, and we still have a lot of great things planned, including a few badly needed site updates in the coming weeks. In the spirit of the “Very Inspiring Blogger” Award here are seven blogs and bloggers who inspire me, and seven things you may not know about me. 1. Brian D. Buckley – It should come as no surprise to regular followers of this blog that Brian is an inspiration. We’ve worked jointly on a couple of theme weeks as well as the occasional lively debate back and forth (I’ll get to you and “Pascals Wager” at some point). Brian has been a great friend and fellow writer for many years and this blog has certainly learned a lot from him in the early faltering days (all 5 months ago). 2. The Happy Logophile – Jo was one of the first new faces to follow and comment on the blog, and has been a continued sustaining presence here from time to time. She’s been kind enough to write posts on questions I’ve posed on her blog, and was an early encouragement (liking my comparison of Spaghetti Code to Revision). While her blog seems to be on temporary hiatus due to the joys of life, I hope to see Jo back sometime soon. 3. Mutterings from BJ Kerry – Whenever I see Ireland come up on the country views, I have a feeling it’s BJ stopping by to say hello. BJ is another consistent commenter as well as a fellow poster of stories and thoughts on writing. I love some of her weird stories inspired by Chuck Wendig posts, and her thoughts on names of characters. 4. Buddhafulkat – For as much as Brian brings the poetry, Buddhafulkat takes it to another level. Between 100 word stories, and particpating in NaPoWriMo, as well as some pretty awesome drawings this has inspiring written all over it. Buddhafulkat is also not afraid to show the love with likes and comments, and was an early encourager of this blog. 5. M. S. Fowle (Mel) – A more recent friend of the blog, M. S. Fowle has a number of stories already out on Kindle Direct Publishing and Smashwords, a brave step that not all of us take. Her speculative fiction offers unique views of the future (and vampires) and she can bring the geek when she wants to. Besides nominating me for my first blogging award, she has been encouraging of many of the main themes here, Fractals and bringing attention back to the CFML. 6. Fresh Ink – A great place to showcase the work of so many people. Always a fresh thought or take on something here. 7. My 2 Old Blogs – While not inspiring in and of themselves, they ended with a fizzle and not a bang, these two serve as a reminder that while previous attempts do not always succeed there are still many more opportunities in the future. 1) My wife and I were married for more than two years (and had dated two years before that) before she ever kissed me without the beard (I’m clean shaven again now after about a year). 2) I am a lover of all things Peanuts. I even own a copy of Snoopy’s Guide To The Writing Life, and have a ceramic Snoopy at his typewriter sitting on my desk. 3) I’m 6’4″, but still not as tall as Brian. 4) My middle name is Robert so yes I am Ben-Bob. 5) My wife and I managed to cross the oval at OSU without anyone crossing our path. It was 4 in the morning and it was raining but we did it. 6) My cat, Dax, ran up onto our porch on Halloween night almost 3 years ago. She’s been purring and rolling around on our smelly shoes ever since. 7) I am a sci-fi nut, but I have never seen Alien or Dr. Who. Thanks Mel for the nomination! See you all next week bright and early! No Alien? You better get on that. 😉 LOL Thank you and congrats! Delighted with your blogger award. It couldn’t have happened to a nicer…(em)… blogger. AND 6′ 4″ I mean wow!. Last night I watched the last episode of Dr Who available on Netflix. I am so sad. Now what do I have to look forward to?? ?